You might be eligible to do a FERS Deferred Retirement if you separate from service before you are eligible to retire on regular FERS Retirement rules. Even though you don’t ‘retire from’ your federal job – you may still be able to draw a pension later. But only if you meet the requirements *before* separating from service. If you have at least 5 years of creditable civilian service before you separate from service – you may ‘have title’ to a Deferred FERS Retirement pension. FERS Deferred Retirement is when you separate from service before you were eligible for immediate retirement – either regular FERS retirement (MRA+30, 60+20, 62+5) or FERS MRA+10 Retirement. If you separate from service with at least 10 years of service, and you have at least reached your MRA – you can do a FERS Postponed Retirement(which is better than a Deferred Retirement). How Does Deferred FERS Retirement Work? Let’s say you have 5 years of creditable civilian service, and you want to leave federal service. How do you do a FERS Deferred Retirement? First – you want to be sure that you have at least 5 years of creditable civilian service (bought back military time doesn’t count towards this minimum requirement). Second – when you separate you must *leave* your contributions in the system. Later, when you reach a specific age (usually 62) – you can contact OPM and file paperwork to start your FERS pension. With this option your pension would be reduced. It will be reduced by 5% for each year you are younger than 62 when you start your pension. This is a serious reduction and the reduction is *PERMANENT*. You could avoid this reduction by just waiting until you are age 62 – then you meet the requirement to be 62 or older with 5 or more years of service. To see more about this reduction check out our page on MRA+10 Early FERS Retirement. Let’s look an an example. Let’s say Bob has 5 years of creditable civilian service. Let’s say his High-3 salary for his service is $55,000. Bob is 45 years old, and he knows he’s not eligible for regular FERS Retirement – but he’s ready to leave federal service anyways. When Bob separates from service, he leaves his FERS retirement contributions in the system. When Bob is 62, he can contact OPM to start his FERS Deferred Retirement pension. How much will Bob receive? Now let’s look at an example with 10 years of service – but we’ll refer to the person in this example as Bill. We’ll keep some factors the same for an easy comparison… so Bill is also 45 and he also has a High-3 salary of $55,000. Since Bill is leaving federal service with 10 years of creditable service, he has more options than Bob when it comes to starting his FERS Deferred retirement pension. Because Bill has 10 years of creditable service, he has the option to start his Deferred pension sooner than Bob (with only 5 years of service) did. Bill has the option of starting his pension when he reaches his MRA. However, if he does this – his pension will be reduced. However, Bill will not receive this amount if he begins drawing his pension at his MRA. It will be reduced by 5% for each year Bill is younger than 62. And this reduction is *PERMANENT*. It will never come back. So Bill would receive $321/month until he is 62. At 62 – his pension will *NOT* go up to $458… it stays at $321 – except that at age 62 he would get his first COLA (if there is one that year). Let’s say the COLA that year was 2% – when Bill is 62, his pension will now be $327/month. There are two ways of looking at this reduction. The glass-half-empty way says that this reduction takes a big bite out of your retirement check. The glass-half-full way says that it is nice to have the choice of this option if you wanted to start your pension before age 62. But what if Bill didn’t want to have his pension reduced? He could wait… If he waited until he was 58, he would only be 4 years from 62 – and his reduction would be only 20%. Etc. etc. If Bill waits until he can do a Deferred Retirement under regular FERS retirement rules – he won’t have the early MRA+10 retirement reduction. In this case, Bill waits until he is 62 to start his Deferred FERS retirement pension. Bill will be able to start his pension at age 62, however he will *NOT* be eligible to resume FEHB because he is doing a Deferred Retirement. Even though Bill had 10 years of service, because he left service before he met *both* the age and service requirement for MRA+10 retirement – he can only qualify for a Deferred pension and can not resume FEHB. This is a huge drawback for Deferred Retirement. 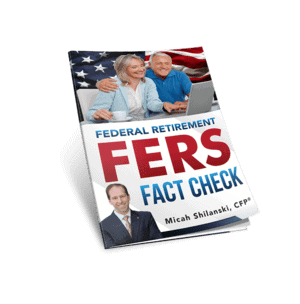 If Bill worked for the government until he was eligible for a Postponed Retirement or an Immediate FERS Retirement – he would have had the option to keep his FEHB into retirement. But even with that drawback – it’s much better to get a Deferred Retirement pension than to take a refund of your FERS contributions when you separate. If you do separate from service, resist the urge to take a refund of your contributions. You are almost always better off by leaving your money in the system. We’ve just gone through several examples for Deferred FERS Retirement. You should also know about Postponed FERS Retirement. They sound the same – but there is a big difference. Click here to learn more about the difference between FERS Deferred Retirement and FERS Postponed Retirement. Could a Deferred FERS Retirement be Right For You? Everyone’s personal situation is unique. And there are lots of variables to deciding whether or not to take a FERS Deferred Retirement. Above all, be sure you understand all of your options *before* you separate fro service. It might be helpful to discuss your options with a financial planner who understands federal benefits.